I'm really shocked that nobody wrote a review on this one yet so I'll break the ice for now. I need to make this clear from the beginning: If fighting isn't your thing, drop this manga, it's not for you. If you read the prequel and liked it, you'll love Tough! But even if you started with this one, you won't be dissapointed, you don't really need to know what happened before to appreciate Tough! As a fan of martial arts/full contact I can assure you that this manga is the real deal. I was really impressed by the art. I love all the characters in Tough!, antagonists included. The most impressive one is Kiichi of course, he's what I would call a "real man", someone who'll respect his principles and promises no matter what. The characters may not be developped too deeply like in other mangas but as I mentioned before, Tough! is a fighting manga, too much words are useless. Delightful to read thanks to the fights and the art but again, I may be repeating myself, this only applies if you're into full contact. No need to explain why, this is a paradise for those who like/practice MMA. The story still revolves around Kiibo in the martial arts world. This manga's story centres on struggles he faces as the heir to the Nadashinkage clan 2 years after the events of Koukou Tekkenden Tough and as his family's martial art style gains more international recognition which was avoided in the prequel manga. The art style is perfect to me. Koukou Tekkenden Tough was great but Tough as a sequel manga is awesome in this aspect. New characters are introduced to the manga. The inclusion of Kiibo's two uncles was awesome to the storyline and making Kiibo's father more of a deuteragonist than just a supporting character (from Koukou Tekkenden Tough) was a definite plus. There is character deveopment in Kiibo too as he's stronger, upholds his beliefs more and is less afraid to die for these beliefs. I liked how the general comedic nature of the manga is retained. Kiibo's remarks, funny and weird facial expressions are still intact (even though it was weird to notice on an older Kiibo, it took some getting used to). I'm a strong fan of full contact body sports and MMA fighting so it's only natural I love this manga and give it a 10 in this part. Tough as a manga is so different from its prequel. 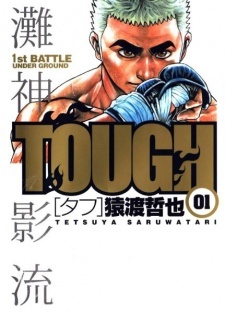 The storylines seemed different in a way when I started Tough (may be it's because Koukou Tekkenden Tough has finished being serialized in English). The inclusion of new characters was good but I'd like to see few old characters (from the prequel manga) that I'm already used to. I don't know if they were brought back in later chapters as I'm just at chapter 183. Oh well, this manga is great.